Hakone is where Tokyo comes to relax and get a taste of the countryside. Around 90 minutes from Shinjuku station by the Odakyu line train, this mountainous area offers convenient transportation, beautiful scenery, a host of attractions and, best of all, a natural hot-spring bath, or onsen, around virtually every bend of the roads that twist through the mountains. The best way to see Hakone is to buy the Hakone Free Pass, available at all Odakyu railway stations. The pass covers all public transport in Hakone – and what public transport it is. As well as a picturesque railway and a bus service, the Hakone area also has a funicular railway, a cable car and a boat that crosses Lake Ashinoko at its centre. Those in a hurry can make the most of their time by trying the ‘Hakone Circuit’, rather than the ‘Full Hakone' (below). Get off the train at either Odawara or Hakone-Yumoto. From there, transfer to the Tozan mountain railway for the 50-minute ride to its terminus at Gora. At Gora, transfer on to the funicular railway up to the end of the line at Sounzan. Here, transfer to the cable car, which takes you down to the banks of Lake Ashinoko at Togendai station. To get across the lake, board one of the pleasure boats and stay on until Hakone-Machi or Moto-Hakone, from where you can take a bus back to where you started. The round-trip should take about three hours, although in the busy summer months it may take longer. While the ‘Hakone Circuit’ will give you your fill of glorious scenery, you’ll be missing out on a lot of what Hakone has to offer. Get off the train at either Odawara or Hakone-Yumoto. If you decide to start your journey at Odawara, it’s worth making a detour out of the east exit of the station to take the ten-minute walk to Odawara Castle (¥400, ¥150 cons. Open daily 9am-5pm, closed 2nd Wed of the month. 6-1 Jonai, Odawara-shi, 0465 23 1373), perched on a hill overlooking the town. First built in the early 15th century, and rebuilt in 1960, this picturesque castle was for centuries an important strategic stronghold. Back at the station, get on the old-fashioned Tozan railway for the next major stop (or the starting point for some), Hakone-Yumoto station. ‘Yumoto’ means ‘source of hot water’, which should give you some clue as to what this small town is about. First mentioned in eighth-century poetry as a place to bathe, Hakone became a great favourite in the time of the Tokugawa shogunate (1600-1868), with bathers travelling two or three days on foot from Tokyo (then Edo) along the Tokaido Way. The station houses a small tourist office, but the main office is up the hill on the left. Here, you’ll find English-speaking assistants, who’ll be happy to hand out maps and pamphlets. Restaurants and souvenir shops also line the same street; this is the place to buy the local speciality: small boxes and other objects made using yosegi-zaiku, a mosaic-style marquetry technique. For dedicated modern bathers, the day may end in Hakone-Yumoto. Although the modern town is unremarkable, it is dotted with hot-spring baths: just about every building of any size is a hotel, or ryokan, and many allow non-guests to use their facilities. One of the locals’ favourites is situated on the steep hillside on the other side of the tracks from the station. The Kappa Tengoku has segregated open-air baths (admission ¥750, bath towel ¥900 (to buy), face towel ¥150 (to buy). Open daily 10am-10pm. 777 Yumoto, Hakone-Machi, Ashigara-Shimogun, 0460 85 6121) surrounded by dense woodland, and a steady army of bathers can be seen trooping up the steps to the baths well into the night. Up the hill from the onsen is the delightful Hakone Kitahara Museum (¥1,300, ¥600 cons. Open daily 9am-5pm. 740 Yumoto, Hakone-Machi, Ashigara-Shimogun, 0460 85 6880), crammed with old-fashioned Japanese and foreign tin toys from the 1890s to the 1960s. The souvenir shop sells wind-up robots and charmingly retro goods imported from China and elsewhere. Back on the train from Hakone-Yumoto, take some time to enjoy the ride itself. It’s claimed that this is the world’s steepest train line, and so sharp are the bends that at three points the train enters a switchback, going forward and then reversing out of a siding in order to continue its ascent. As you climb the mountain you will see water pouring out of the hillside and cascading under the tracks, some of it still hot. The next station of any note is Miyanoshita. This is home to one of the highest concentrations of onsen baths in the area and is where the first foreigners in Japan came to bathe in the 19th century. To cater for them, the Fujiya Hotel was built in 1878, a wooden mix of Japanese and Western styles. Non-residents are free to pop in for a drink or a bite to eat. Two stops up the line, at Chokokuno-Mori station, is one of the great glories of Hakone. The Hakone Open-Air Museum (¥1,600; ¥800-¥1,100 cons. Open daily, Mar-Nov 9am-5pm, Dec-Feb 9am-4pm. 1121 Ninotaira, Hakone-Machi, Ashigara-Shimogun, 0460 82 1161, www.hakone-oam.or.jp) must be one of the most spectacular in the world. Set on a mountainside overlooking a series of valleys leading to the sea, the museum is dedicated to modern sculpture from all over the globe. Exposed to the elements is a world-class collection of works by Moore, Rodin, Antony Gormley, Alexander Calder, Takamichi Ito and Niki de St Phalle. It’s a great place for kids. There’s also a display of ceramics by Picasso in a separate pavilion. From here, it’s a ten-minute walk to the next station, Gora, the terminus of the Tozan railway and the start of the funicular that climbs the mountainside. If you’re changing from the train, there will be a carriage waiting for you. The first stop on the funicular, Koen Shita, provides a pleasant diversion in the shape of Gora Park (¥500. OPen daily 9am-5pm. 1300 Gora, Hakone-Machi, Ashigara- Shimogun, 0460 82 2825, www.hakone-tozan.co. jp/gorapark), a landscaped hillside garden that makes great use of the natural hot water in its hothouses. A walk uphill through the park will bring you to the next stop on the funicular. This is a good point to visit the Pola Museum of Art (¥1,800; ¥700-¥1,300 cons. Open daily 9am-5pm. 1285 Kozukayama, Sengokuhara, Hakone-Machi, Ashigara-Shimogun, 0460 84 2111, www.polamuseum.or.jp), deep in the surrounding forest. The museum houses 9,500 works by the likes of Renoir, Picasso and Monet. To avoid damaging the beauty of the countryside, the building is constructed three floors underground, and is only eight metres (27 feet) tall on the surface. To reach the museum, take a bus from Gora station bound for Shisseikaen-mae. The funicular terminates at Sounzan station, and it’s here that many people’s favourite part of the Hakone experience begins: the cable car, or Hakone Ropeway, as it’s known. Riding over the peaks and valleys of Hakone, this four-kilometre (two-and-a-half-mile) ride is Japan’s longest – and the world’s busiest – cable-car route. Around halfway along its length is Owakudani (‘big boiling valley’), one of the most breathtaking sights in Hakone. The car passes over, at a height of around 60 metres (200 feet), a smoking hillside streaked with traces of sulphur from the volcanic activity below. The air simply reeks of rotten eggs. On top of a mountain peak sits Owakudani station, the centre of a large tourist complex of restaurants and gift shops. On a clear day – a rarity, since it’s often too cloudy – you can see the peak of Mt Fuji looming over the mountain range in the distance. You can also walk to the source of some of the steam that rises out of the mountain, the ancient crater of Mt Kamiyama, the pathway passing over hot streams of bubbling water. The air is thick with hydrogen sulphide, and signs warn of the dangers of standing in one place for too long for fear of being overcome by fumes. If you feel like a snack, try a hard-boiled egg at the top of the path. Sold by the half-dozen for ¥500, the eggs have been cooked in the hot-spring water, the sulphur turning their shells black. According to legend, eating one of these eggs will prolong your life by a year. From Owakudani, the Hakone Ropeway passes over several more valleys before descending to terminate at Togendai, on the banks of Lake Ashinoko. The lake is believed to be in the crater of a volcano that blew its top 400,000 years ago. The volcanic activity that goes on beneath the waters to this day ensures that it never freezes over. 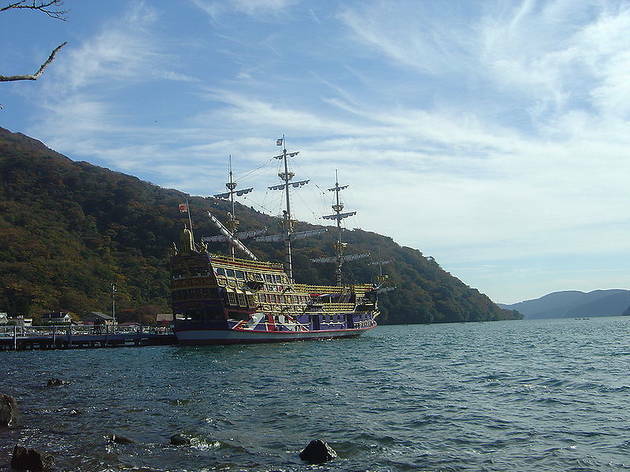 From here, a pair of incredibly tacky pleasure boats, one done out as a Mississippi steamer, the other as a Spanish galleon, cross the lake to Hakone-Machi and Moto-Hakone. Only 500 metres (1,600 feet) or so separate the two destinations, but for ease of walking, get off at Hakone-Machi and turn left (with the lake behind you) to head for Moto-Hakone. On the way is the site of the Old Hakone Checkpoint (¥500, ¥250 cons. Open daily Mar-Nov 9am-4pm, Dec-Feb 9am- 4.30pm. 1 Hakone, Hakone-Machi, Ashigara-Shimogun, 0460 83 6635), where travellers to and from Edo would be stopped and often interrogated by border guards. Ruins of the original checkpoint still stand, while other buildings have been reconstructed and opened to the public as a museum. Set back a little from the modern road is what’s left of a cedar avenue, planted along the Tokaido Way in the early 17th century. Paved sections of the Tokaido Way are still extant, and keen walkers can take a short hike from here along one such section, away from the lake towards Hatajuku. On a promontory into the lake between the two boat stops is Onshi Hakone Koen Park (Hakone Detached Palace Garden. Free. Open daily 9am-5pm. 171 Moto-Hakone, Hakone-Machi, Ashigara-Shimogun, 0460 83 7484, www.kanagawa-park.or.jp/onsisite). The garden of an 1887 villa that once belonged to the imperial family but was destroyed in an earthquake. Further along, past Moto-Hakone and down the side of the lake, is the Hakone Shrine, its history going back 1,200 years. The site is clearly marked by a red torii (gate) that stands in the lake. Once you’ve walked your fill of the area – and there’s lots more to see in the Hakone vicinity – head back to Moto-Hakone and take a bus back to Odawara. All buses to Odawara stop in Hakone-Yumoto too. Taking kids to Hakone? 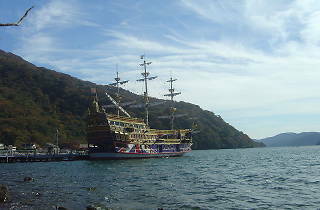 When they tire of the tourist trail, take them to Yunessun (1297 Ninotaira Hakone-Machi Ashigara- Shimogun, 0460 82 4126, www. yunessun.com/english), a spa resort with waterfalls, three water slides, a hot-spring cave, and baths filled with green tea, coffee, wine or saké. Since most of the area’s activity centres on the hotels, it’s hardly surprising that there are few independent restaurants worth seeking out – though the village of Sengokuhara has more options than most. For the truly hungry, there are snack bars serving curry, noodles and the like at Owakudani and Togendai stations, and on the lake at Hakone-Machi. The Bella Foresta restaurant in the Open-Air Museum serves a decent buffet lunch for ¥1,680, while all the large hotels have at least four restaurants that are open to non-guests. At the Pola Museum, there’s a café serving snacks and drinks (10am-4.30pm daily) and an upmarket French-style restaurant (11am-4pm daily). There are hundreds of places to stay in Hakone, ranging from cheap ryokan to top-class hotels. Most have their own hot springs. Many have higher rates at weekends, peaking during New Year and Golden Week in May. If you intend to use Hakone-Yumoto as a base, cheap options include the Kappa Tengoku: a double room here costs from ¥6,600 per night on weekdays, although its proximity to the railway tracks might mean an earlier awakening than you’d bargained for. Up in the mountains, the Fujiya Hotel (359 Miyanoshita, 0460 82 2211, www.fujiyahotel.co.jp, ¥19,830-¥41,880 double) dates back to 1878 and oozes history – a feature that plays better in the lobby and gardens than in the rooms. In Sengokuhara, the small ryokan Fuji-Hakone Guest House (912 Sengokuhara, 0460 84 6577, www.fujihakone.com, ¥11,850-¥12,900 double) is a good budget choice. The friendly proprietor, Takahashi Masami, speaks English and is happy to offer sightseeing advice. You can get to the inn by bus direct from Odawara or Hakone-Yumoto stations; alight at the Senkyoro-mae bus stop. Sister outfit Moto-Hakone Guest House (0460 83 7880, same website, ¥11,550 double) is on the other side of Lake Ashinoko. Overlooking the lake is the Palace Hotel (1245 Sengokuhara, Hakone-Machi, 0460 84 8501, www.hakone.palacehotel.co.jp), where doubles start at ¥18,300 in low season. For absolute luxury, there’s the Hyatt Regency Hakone (www.hakone.regency.hyatt.com), where the Mountain View twin rooms (¥23,000-¥45,000) are enormous, as are the scenic terraces. But nothing can rival the ten-room Kinnotake boutique hotel (0460 84 3939, www.kinnotake.com), whose rooms come with a private hot spring and a contemporary Japanese-style interior of the kind that design fans dream about (¥36,000-¥54,000 per person). By train There are two types of Hakone Free Pass, available at all Odakyu stations and many travel agents. The two-day pass gives you unlimited journeys for ¥5,000, available from Shinjuku Station. The three-day pass costs ¥5,500. The ticket price also covers the basic fare on an Odakyu train from Shinjuku to Hakone. If you want to travel in comfort on the super-express Romance Car, you will need to pay a supplement of ¥870. If you hold a JR Pass, the most cost-effective way of reaching the area is to take a JR Tokaido shinkansen to Odawara station, then buy your Hakone Free Pass there. As this pass does not include transport to Tokyo, it costs ¥3,900 (two days) or ¥4,400 (three days). The Free Pass also gives discounts at many local attractions. Hakone-Yumoto Tourist Information Kankou Bussankan, 698 Yumoto, Hakone-machi, Ashigara-Shimogun (0460 85 8911). Open 9am-5pm daily. Odakyu Sightseeing Service Centre Ground-floor concourse near west exit, Odakyu Shinjuku station (5321 7887, www.odakyu.jp/ english/center). Open 8am-6pm daily. The Odakyu train line’s information counter inside the station is aimed at foreign visitors (staff speak English). You can buy the Hakone Free Pass here and make hotel reservations. Odawara Tourist Information 1-1-9 Sakae-machi, Odawara-shi (0465 22 2339). Odawara station, in front of the ticket gate. Open 9am-5pm daily.